It's been a while since I posted up some test results, but the arrival of a couple of new lenses here at chez hefty1 has given me the impetus to actually do one again. As before, the tests are completely subjective so if you have any complaints about procedures then please use the new style complaint forms; available from all branches of Jessops when you buy any brand new piece of genuine Pentax equipment. The test comprises two parts. Firstly I'll be looking at how each lens behaves at various apertures on a tripod, then I'll be showing some examples of how each lens behaves in "real world" shots outdoors and hand-held. 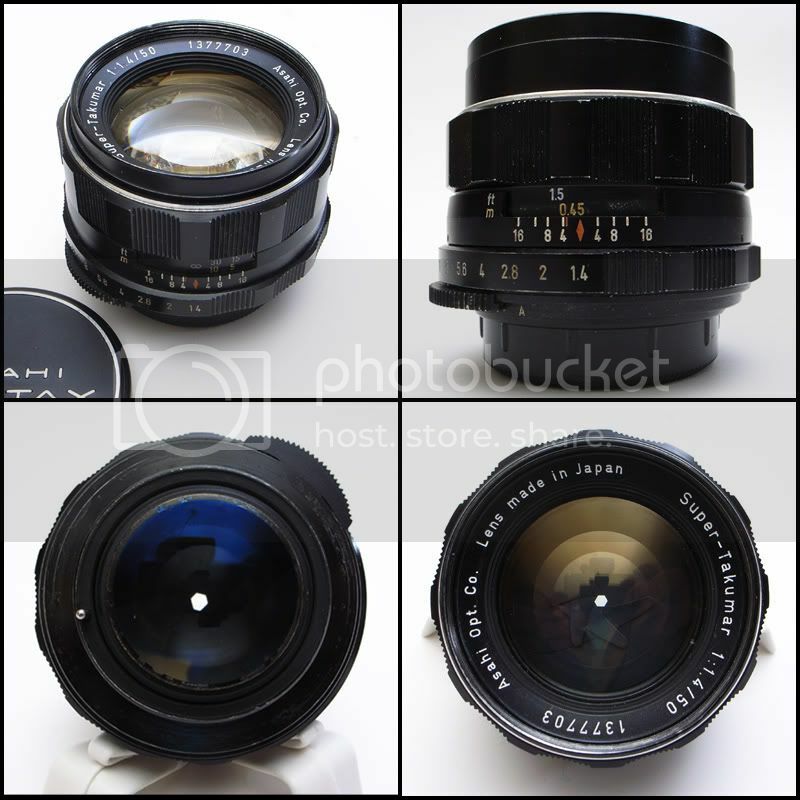 Starting with the Takumar 58/2, this was one of the three lenses produced by Asahi Optical to go with the original Asahi Pentax in 1957; the first lenses they produced with the M42 thread mount. Each lens had a similar focal length but a very different design - this was an age of experimentation for Asahi. 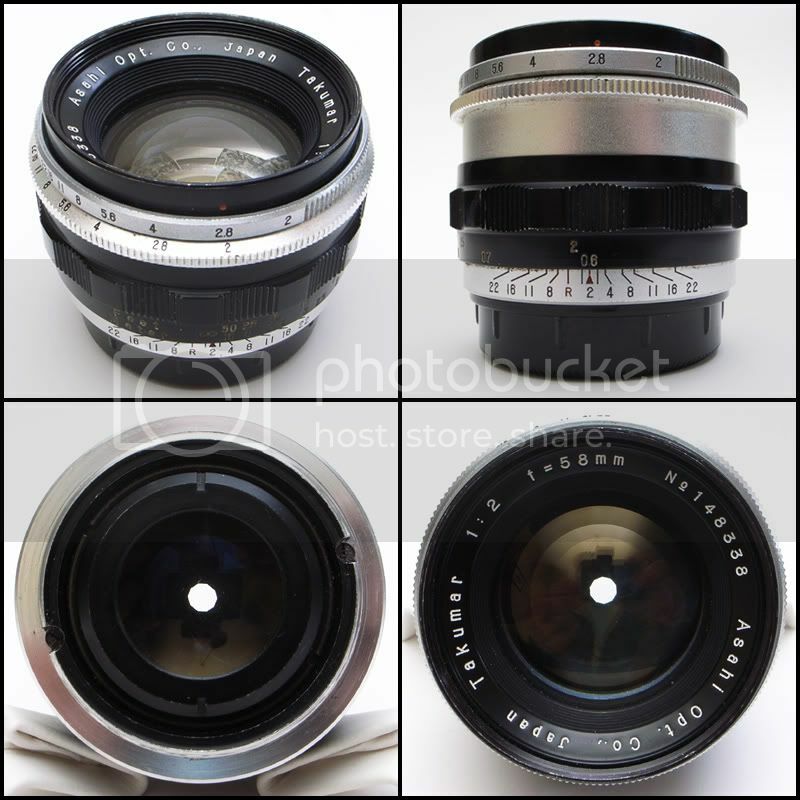 The "budget" model was a 58mm f/2.4 based on Voigtlander's Heliar design that had previously been used on large format cameras. It was the first (and, as it turned out, last) Heliar to be made for a 35mm SLR, the results lacking the neccessary resolution for the miniature 35mm format. 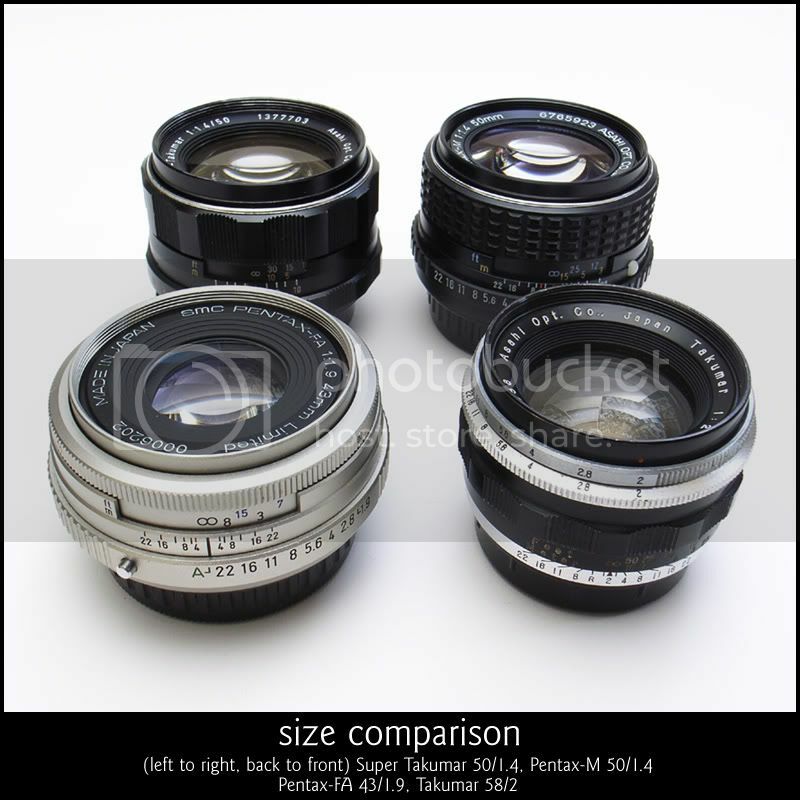 The middle model was a 55mm f/2.2 based on the double gauss (Planar) design - it was sharp, had great contrast, was cheap to manufacture and gave the possibility of faster speeds in a compact package. 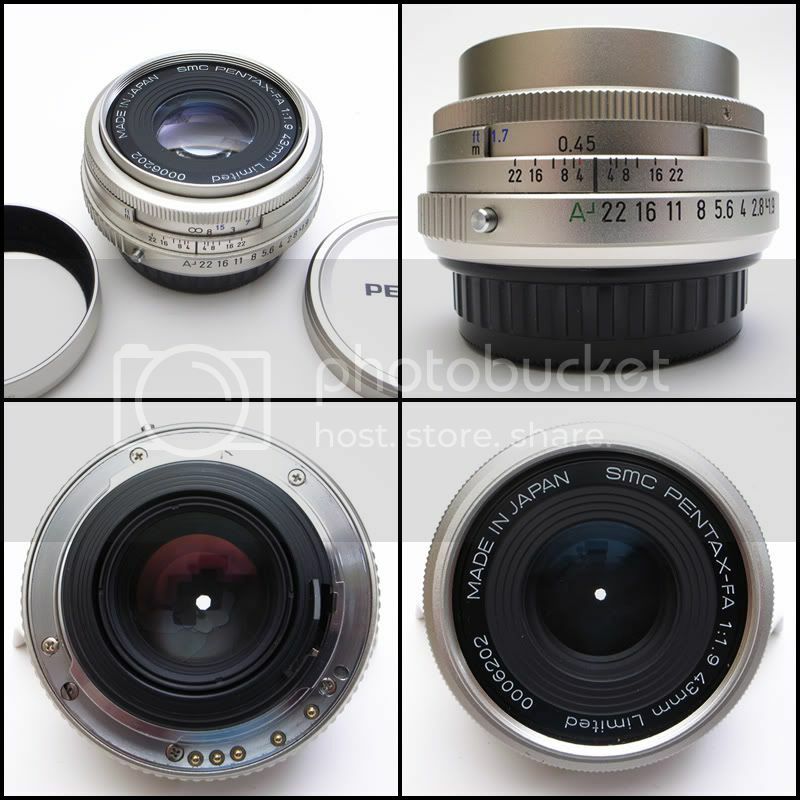 It sold like hot cakes and the design became the basis for every 50/55mm non-macro lens that Asahi/Pentax have made since - right up to the current FA 50/1.4. Finally there was the lens being tested here - the Takumar 58mm f/2. This was a classic Sonnar design and remains to this day the shortest focal length Sonnar ever made for any 35mm SLR camera. Unfortunately, Sonnars shorter than 58mm require the rear element to sit closer to the film plane than is feasible with an SLR without fouling the mirror - if you want a wider Sonnar then it has to be on a rangefinder. This particular Sonnar was also not helped by the fact it cost far more to manufacture and buy than the 55/2.2 while not being as ultimately sharp. Still, there's more to a lens than sharpness alone and Sonnars tend to make up for their lack by producing oodles of lovely bokeh, so we'll see if this one is true to its heritage. My example is a little yellowed and has some brassing but the glass is pretty much perfect otherwise. The focussing isn't quite as smooth as later Takumars (Asahi had yet to discover the liquid silk they used in later helicoids) but it's still much better than other lenses of the era. Because they sold in such small numbers (they were only in production for the single year) getting hold of any example is like finding a hen's tooth. Received wisdom is that they were only sold with a distance scale in feet or meters depending on the market, however, mine has both which makes it the rarest of the rare in Pentax Land! Next up is the 1964 Super-Takumar 50/1.4. This lens was produced with the aim of knocking Zeiss off their perch as the ultimate quality available for 35mm cameras. No expense was spared in making a lens that consisted of a dizzying (by current, let alone 60's standards) eight elements in six groups, including an incredibly hard-to-manufacture cemented triplet where both cemented surfaces were curved (many manufacturers saved money by making the surfaces that met flat, but Asahi wanted the very best performance that could be achieved without any compromises). Unfortunately, although the lens was hailed by the press as a Zeiss-killer, Asahi lost money on every one it sold - a situation that couldn't go on for very long. Less than a year later the lens was replaced by another Super-Takumar 50/1.4 with a simplified seven elements in six groups design - this design (with the odd minor tweak) was then the basis for the Super-Multi-Coated Takumar 50/1.4, the SMC Takumar 50/1.4, the K 50/1.4, the M50/1.4, the A50/1.4, the F50/1.4 and the FA50/1.4. It's also the basis for the K and A 50/1.2's, albeit with oversized glass elements. Once again my example is yellowed (this is due to the radioactive thorium used in the glass) and has some brassing to the barrel, but other than this the glass is in pretty good shape! Although not as rare as the Takumar 58/2 above, this is still quite an uncommon lens. You can tell the early (8 element) lens from the later (7 element) version by the markings (the switch has A and M instead of Auto and Manual and the aperture ring has the f/2 stop engraved with a number instead of a dot) and the fact that the rear element protrudes when the lens is at infinity. It's because of this protrusion that Asahi had to modify cameras of that era so that the actuator didn't foul the back of the lens - these modified cameras had an orange letter R on the rewind knob instead of a green one. By now Asahi had hit upon the buttered silk formula for focussing helicoids - just beautiful! 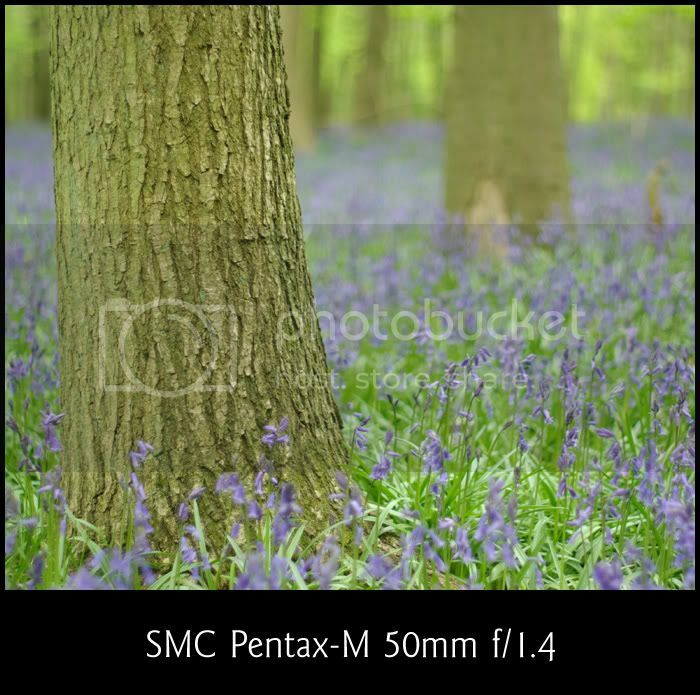 The third lens in the line up is the Pentax-M 50/1.4. 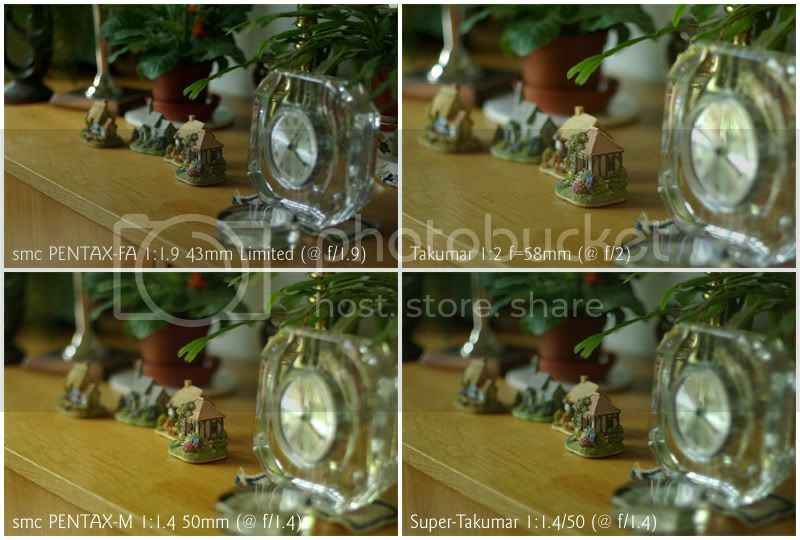 As mentioned above, this lens shared the same optical formula as its predecessors dating back to the (second version) Super-Tak, and its descendents - right up until now. The lens (in its various incarnations) has won many plaudits for its exceptional imaging quality and I'm sure most people reading this will be familiar with one of the versions. I'm using the M series lens because it's the one I happen to own, and it's my favourite in terms of handling. The results should be broadly similar whether yours is a 40 year old screw mount or a brand new FA though (some argue that the tweaks made at the time of the introduction of the A series make them slightly sharper, however, the differences - if any - are so small that they could easily be due to sample variation. This time my example is pretty near to mint! As this isn't a rare lens like the previous two I've had the luxury of being able to buy and sell several samples on my way to owning this one, and I can't imagine I'd find a finer example both optically and mechanically. The M series lenses are little jewells with unmatched build quality and super-smooth handling - probably my personal favourite of all the Pentax lens lines. Yes they're a pain on digital due to the lack of the A setting, but on the MX, LX, etc they're just perfect. Finally, the fourth lens on test is the Pentax-FA 43/1.9 Limited. 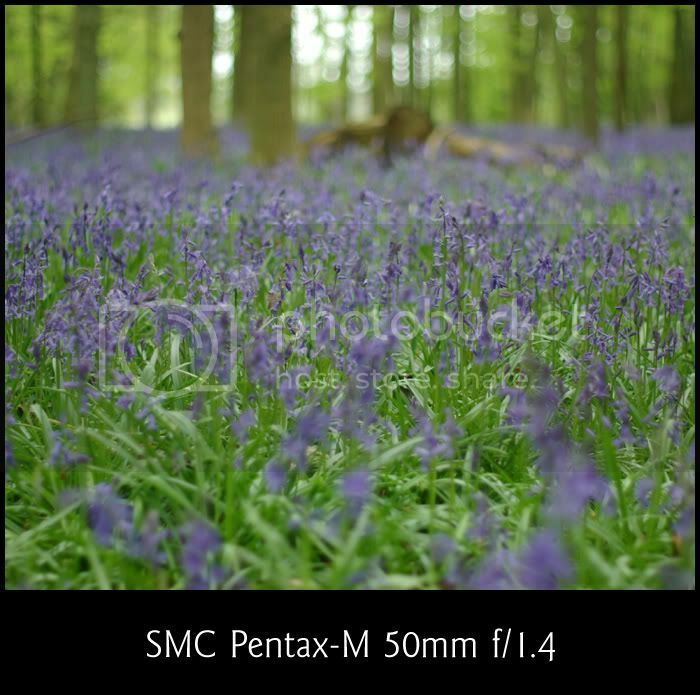 Introduced in 1997, this was the first normal lens from Pentax to radically deviate from the tried-and-tested formula used in the 50mm lenses. The lens has become a bit of a legend due to its uncanny ability to render the tiniest detail - it's almost certainly the sharpest lens that Asahi/Pentax have ever produced and I'd be very suprised if there's a sharper 35mm format lens out there from any manufacturer (and I include Zeiss and Leica in that sweeping assumption). 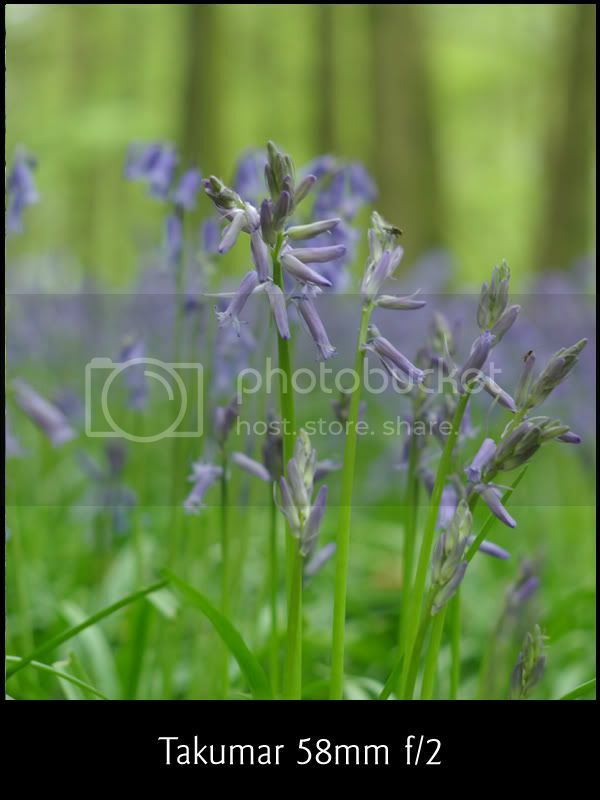 The lens isn't without its faults, the price of having such super-sharpness is that bokeh can be rendered quite harshly so backgrounds need to be chosen with more care than with almost any other lens I've ever used - when it (I!) gets it right though it is truly peerless. The wider angle of view combined with the (comparatively) slow maximum aperture of f/1.9 means that you can't get quite such a narrow depth of field as the other lenses here wide open, although it's not too far off. 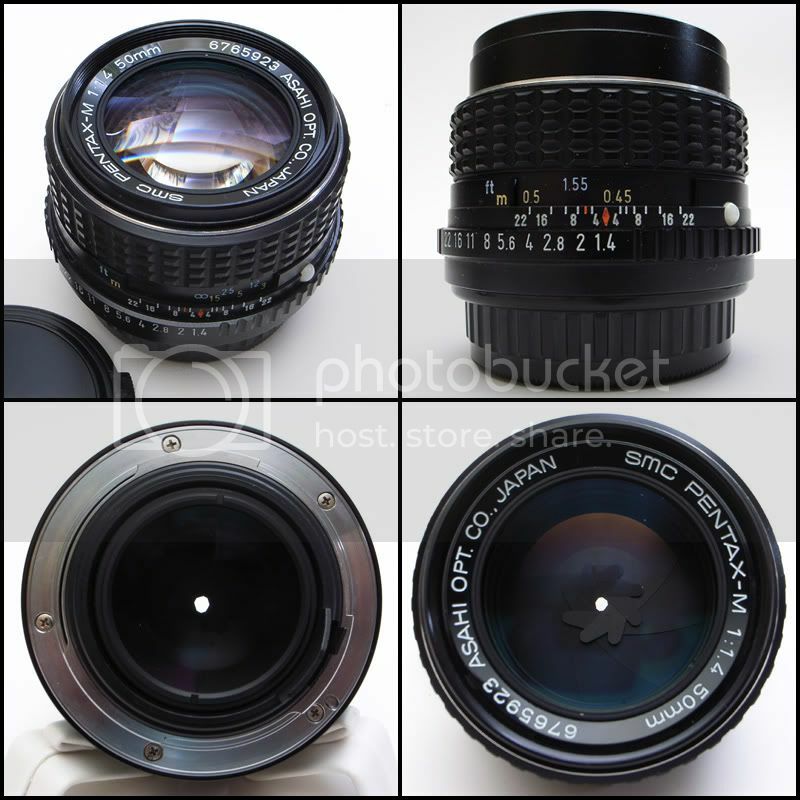 This is another lens that isn't exactly rare or hard to get hold of, although I'd balk at paying current prices for one! I actually bought this one here on the forum from Kim Coxon (he of pentax-manuals.com fame) a couple of years ago when I was just starting out on my Pentax travels. It's still in as-new condition despite it having had rather a lot of use since I bought it, in fact it was my go-to lens that remained firmly attached in my camera bag until the arrival of my DA35 Macro last year. Although it gets less use than it once did I can't imagine ever parting with it somehow. Ignoring the perspective distortion, you can see that the FA43 has the lowest profile but the greatest girth; I assume this is because it's the only one here that has to house the gearing for an AF mechanism. It also has the smallest front element, although it uses 49mm filters (as do the two 50mm lenses) compared to the 46mm filter size employed by the Takumar 58/2. Picking each one up reveals the Takumar 58/2 to be the featherweight of the bunch, the other three being roughly equal (but still light) - this is probably down to aluminium construction including the mounting thread - care is required here to ensure no cross-threading occurs! 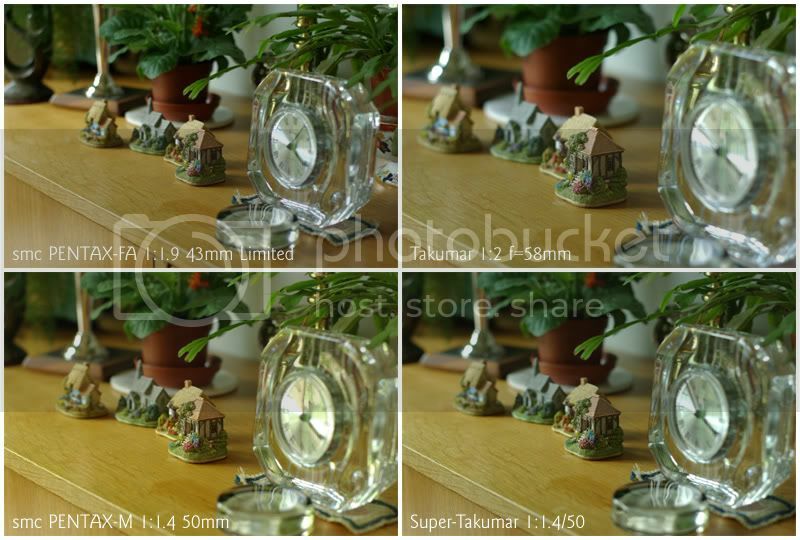 It comes as no great suprise to find that the two 50mm lenses are almost identical in both size and weight. 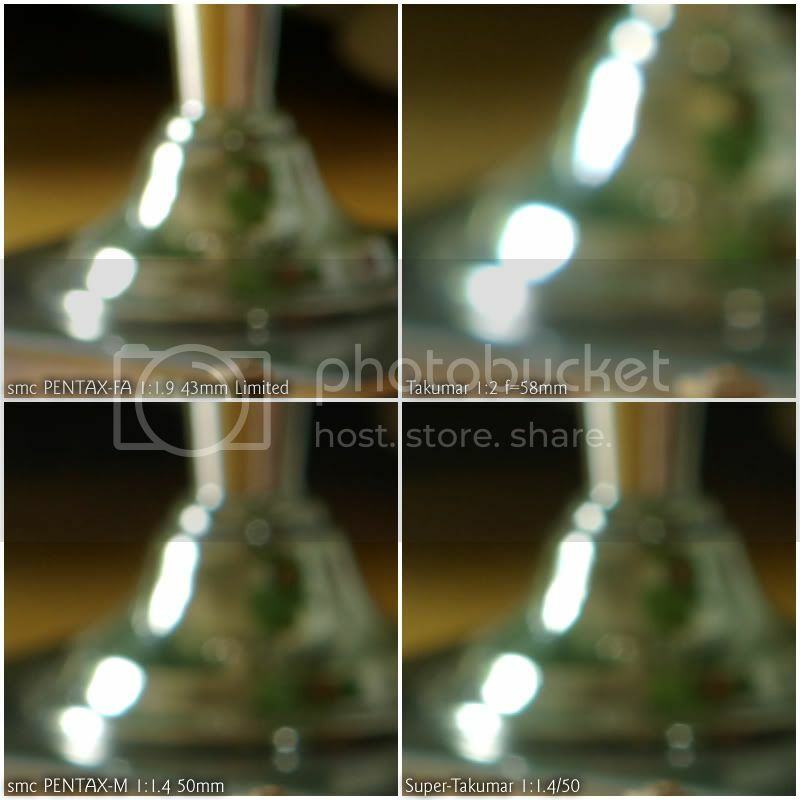 I positioned the camera on a tripod and kept it in exactly the same position while taking a variety of shots at different apertures. The light was metered at f/2.8 1/15sec (ISO100) and variations in exposure are due to shifting of clouds outside - although it was fairly uniformly grey that afternoon. 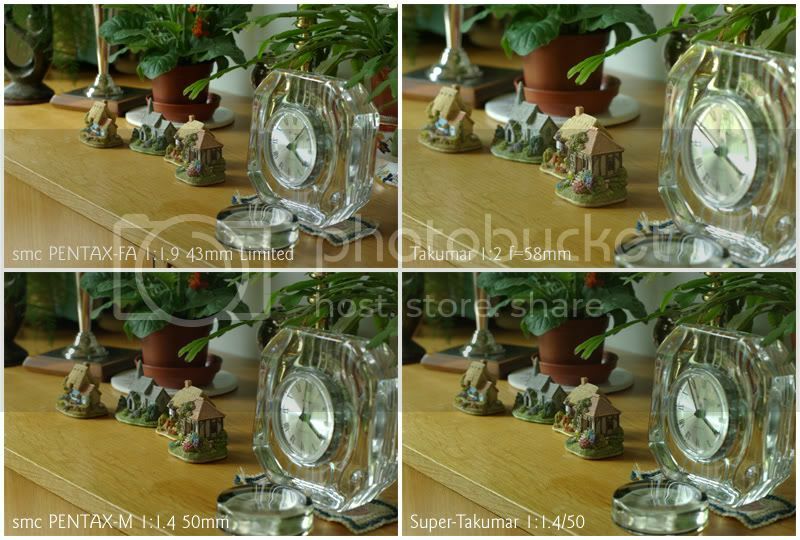 The white balance was set for "Daylight" so shifts in colour balance are a product of lens coatings (or lack thereof) in the main. 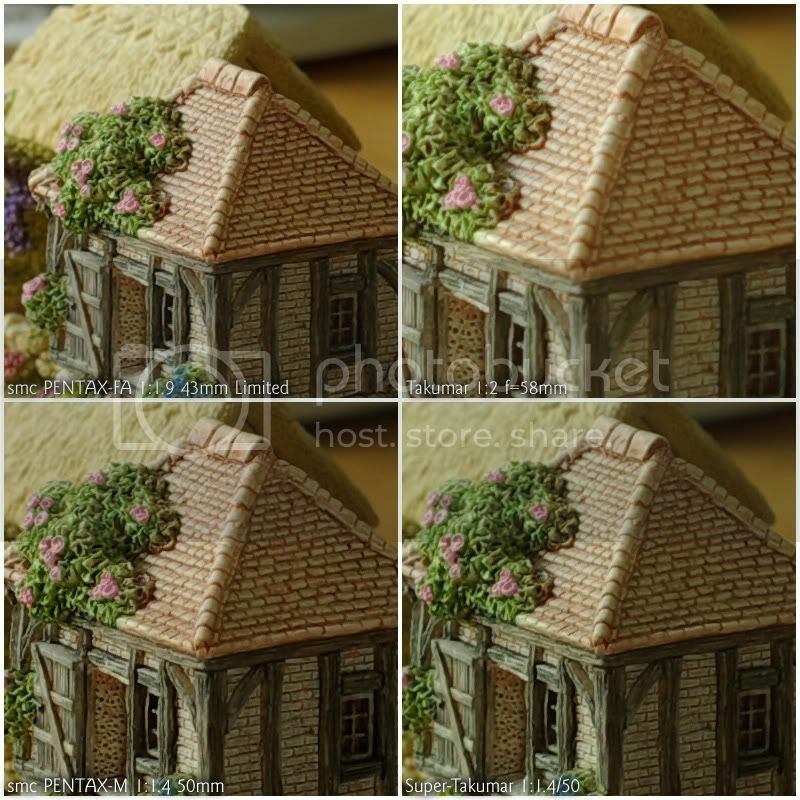 The shots were taken in RAW and converted in Pentax Photo Lab without any additional sharpening, etc. The crops are at 100% (1:1 pixels or however you want to say it). The camera used was my Pentax K10D. At this size you'd be hard pressed to say which was "best" as they all turn in attractive results, I would expect this to hold true for prints up to around 7"x5" too, so let's have a closer look to see how bigger prints would fare. Wide open the FA43 is resolving more detail than the two 50's, which in turn are sharper than the 58. By f/2.8 the two 50's are catching the FA43 which is still marginally sharper, the 58 doesn't appear to be improving at quite the same rate. By f/5.6 (about as sharp as things get before diffraction kicks in at f/8 and smaller apertures) the FA43 is still clinging doggedly to its sharpest title but the two 50's are within a whisker - if you added some unsharp mask in PP then I doubt you'd see any difference even at print sizes in excess of A3. The 58/2 is by no means a bad lens but it's being outclassed comprehensively in this part of the test. Don't forget though that the results from the 58/2 would still be perfectly useable and that in some areas (like portraiture) the slightly soft rendering of the original fast Takumar would actually be preferable. 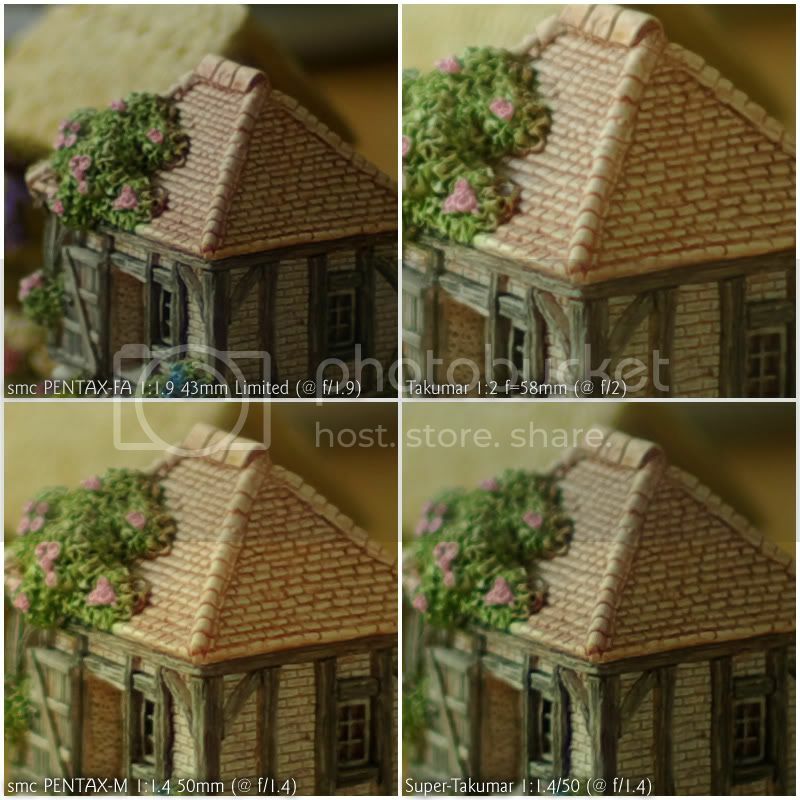 Of the two 50mm lenses I would say the seven element M series is just a touch sharper, but that could easily be down to miniscule variations in the exact focus point. Wide open the FA43 goes from first place in the last test to last place in this one. The halos around the light points are very distracting, which is why this lens needs backgrounds chosen with care. The Super Takumar 50 is better, but only just; and the Takumar 58 is a big improvement (as you'd expect from a Sonnar). The suprise here though is the M50 which has produced a lovely result with smooth transitions and barely a hint of halos. All four lenses put in an improved performance at f/2.8 with smoother renderings all round (the FA43 is still showing more signs of halos than I'm 100% happy with though) and we start to see the shapes of the apertures in the two 50mm lenses (although personally I have no real problem with that, there are those who insist on more blades = better bokeh). At this stage the M50 and the Tak 58 are probably joint favourites for me with the Super Takumar not far behind. Finally at f/5.6 all the lenses are doing a good job - even the FA43! I'd say the Super Takumar has just nudged ahead of the M50 now and that the Takumar 58 just about wins by a hair's breadth. So with the formal part out of the way it's time to move on to part 2 of this review. I wanted to see how each lens performed out "in the wild" with no tripod and me just snapping away at pretty things - this is, after all, how they actually get used in my hands. 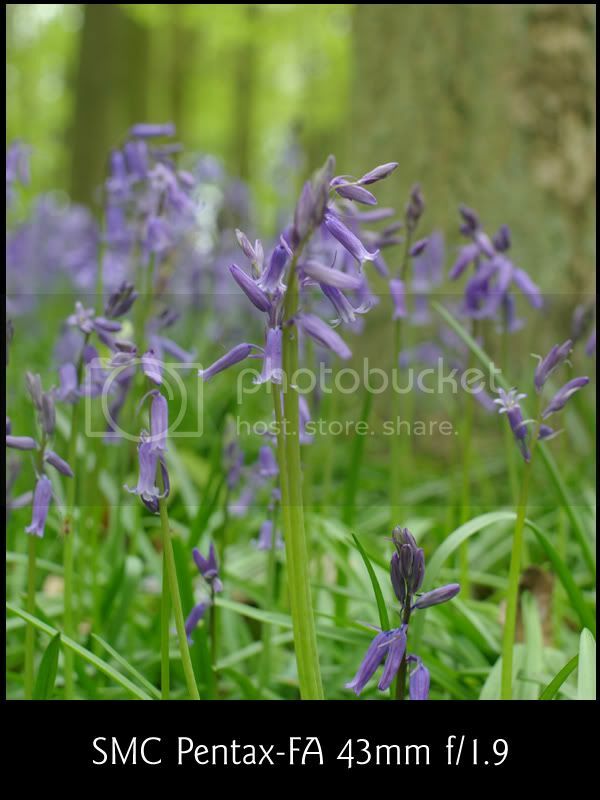 The bluebells were out up at Ashridge this week which seemed as good an opportunity as any; would one of them prove to be significantly better than the others? 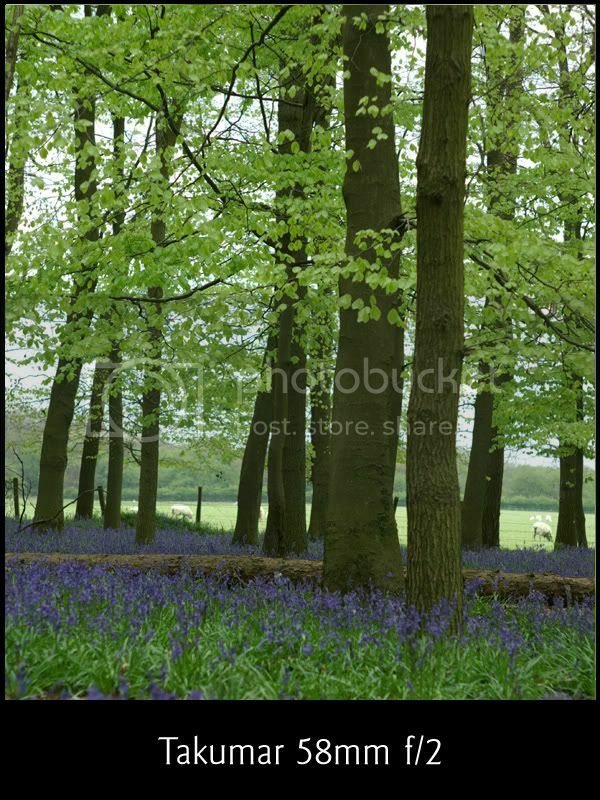 In the first shot you can see why the FA43 makes a perfect landscape lens; at middling apertures everything is rendered sharply and in the full size image you can pick out distant details (individual leaves, etc) without the need for any extra PP sharpening. 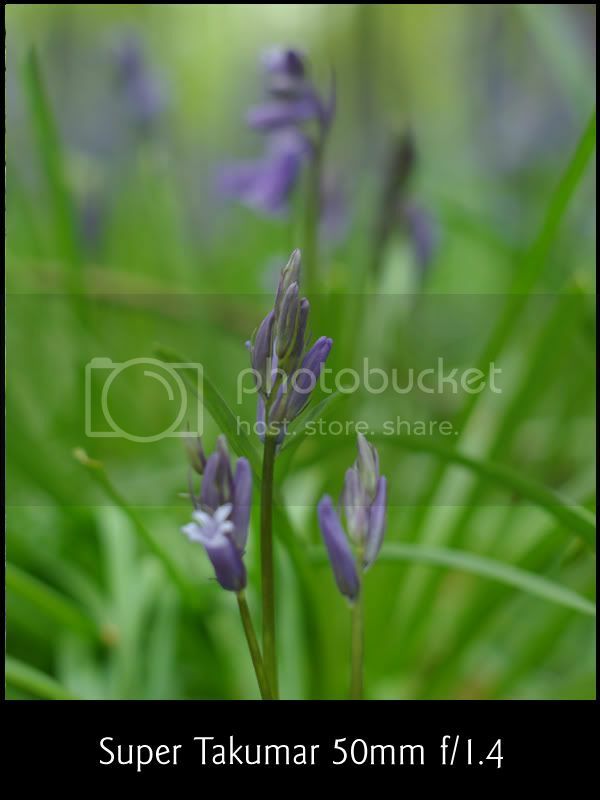 In the second shot the foreground bluebells are rendered quite pleasingly with plenty of detail but the background bokeh is just a little "nervous" with too much going on and distracting from the subject. In other words exactly the performance I had suspected! 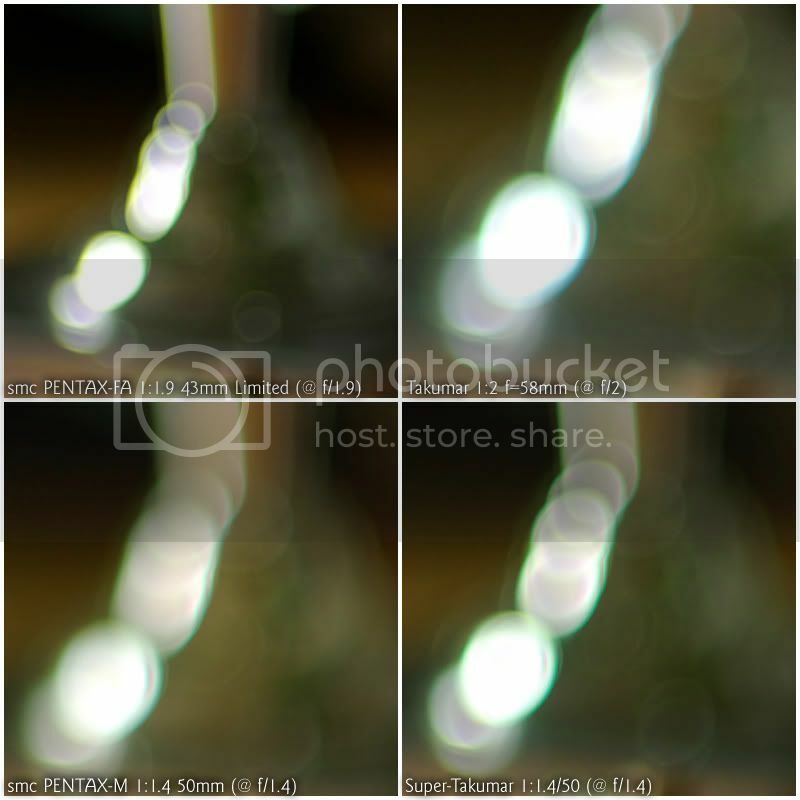 As we've seen the M50 is capable of very sharp shots when used at smaller apertures, however, both the above examples were taken wide open at f/1.4 and show that even here the results can be very sharp indeed with a very neutral bokeh. A super performance! The first shot here was taken at a mid aperture and shows that although the Takumar isn't as critically sharp as the other lenses here it's sharp enough for most purposes. The sheep in the field behind are ever-so-slightly soft and the overall feel is quite dreamy - a very Sonnar-like performance. The second shot is also very typical of a Sonnar; the foreground subject being nicely rendered whilst the background looks like it's been painted with a broad brush. Overall the pictures I took with this lens I felt to be very appealing, if not perhaps the best from a technical point of view. This seems to be the best all-rounder of the bunch. The first shot is almost as sharp as the results from the FA43 while the second shot has some of the prettiest bokeh of all the pictures I took that afternoon (around 100 between the four of them). In a blind test I'd have said the lens used for these photos was a Zeiss Planar, and that's a pretty good recommendation in my book! So which is the best lens? All of them! The FA43 is the King of detail and will bring out every last little piece of information in a photo. The Takumar 58 has a lovely soft dreamy quality that makes it the portrait champion. The Super-Takumar 50 and the M50 are harder to seperate but offer the best all-round performances, with plenty of detail at all apertures and gorgeous bokeh. I would happily recommend any of these lenses to anybody. Thanks for that, always interesting! I love lenses! Great review Hefty. You aren't doing my LBA any favours! If you wanted to add the DA*55 to it, you can always borrow mine! Excellent piece, Hefty. - I know a certain national photographic magazine, with the initials AP, that ought to give you a job, doing this sort of thing! Coincidentally, I bought a Paterson lens testing chart, this morning. So, I'm looking forward to doing a bit of resolution testing, myself. No man is worth his salt, who has not been banned from at least one Forum, and two Flickr groups. I expect to see the results in full posted here first then. Good choice. As an all-round lens it's hard to beat and it's great value for money too. Thanks for that Hefty,very informative.Appreciate the effort you put in.I also love the first Pentax beauty line up image. Regards Tony. K7,DA*50-135, 35mmLTD Macro, 21mm Ltd, Voightlaender 58mm 1.4 NOKTON SL,Ricoh GRD,GRX, Zeiss 100mm f2 Makro Planar.Zeiss Ikon ZM,Zeiss f1.5 C Sonnar. It ain't no sin to take off your skin,and dance around in your bones.Tom Waits. Before I looked at the images, I was expecting to like the FA43 ones the best, as it's one of my favourite lenses. 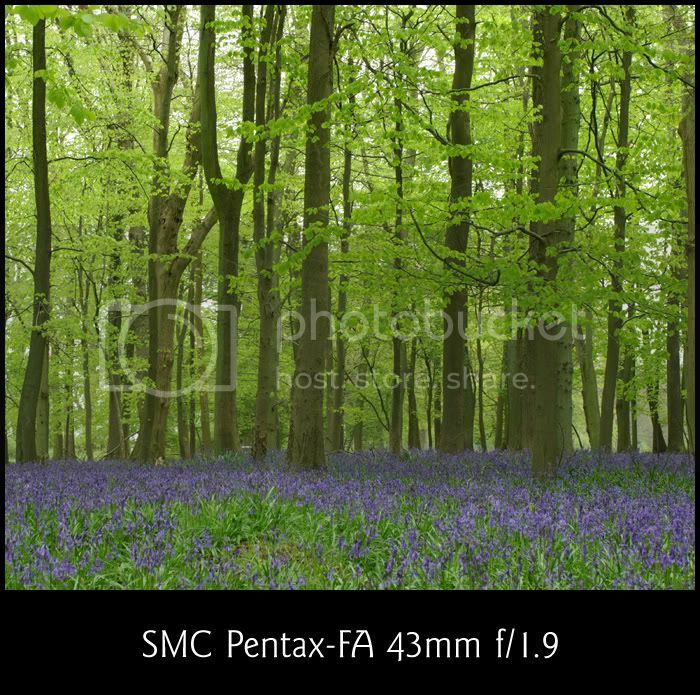 I also love the first Pentax beauty line up image. Sssshhhh! Don't tell anyone but that shot (and all the shots *of* the lenses) was taken with the GRD - my camera of choice for eBay etc. It suprised me too! The FA43 still rules for landscape work where you want Ansel Adams style sharpness all over, but for general work the nifty 50's are very hard to beat and the Super-Tak turned out some of the best photos during my day in the woods. I actually ran a roll of film through both the Spotmatic and the S1a yesterday and stuck to the two Taks exclusively. I'll be down at SnappySnaps tomorrow so I can see how they've done on film too. 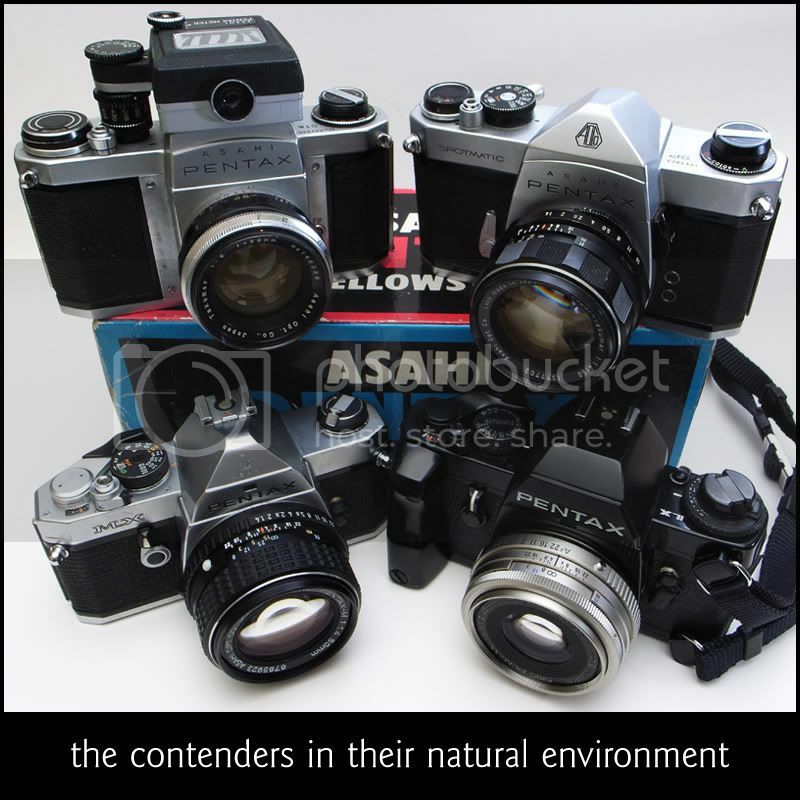 [quote:3496ace15f="Tony-O"]I also love the first Pentax beauty line up image. It's OK Hefty i can keep a secret. Still use mine a lot for b+w. Regards TONY. Pentax M and A primes over the years). 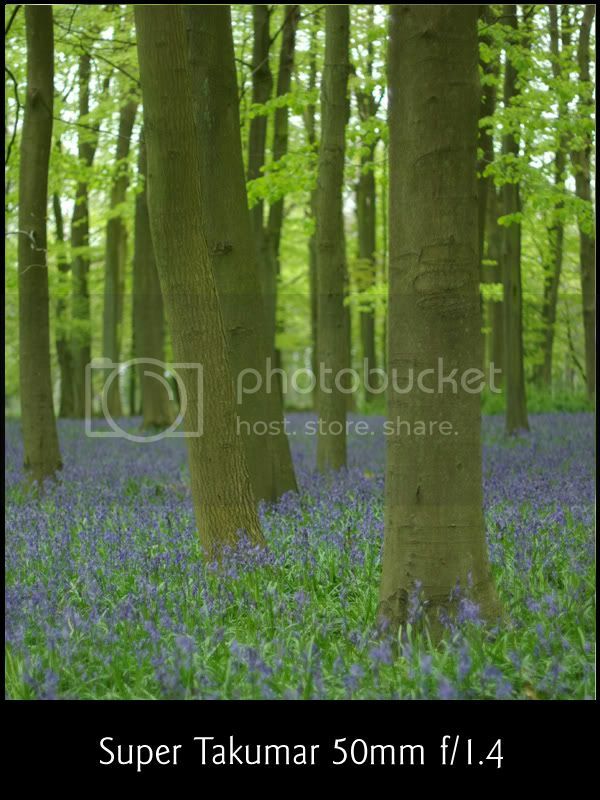 And I just can't get over how much I like the look of the Takumar 58mm shot of the bluebell woods! For me it's just got something that puts it in a class of its own. and where I can get some!